Copyright © Lillian F. Schwartz 1968, 2012 All rights reserved. 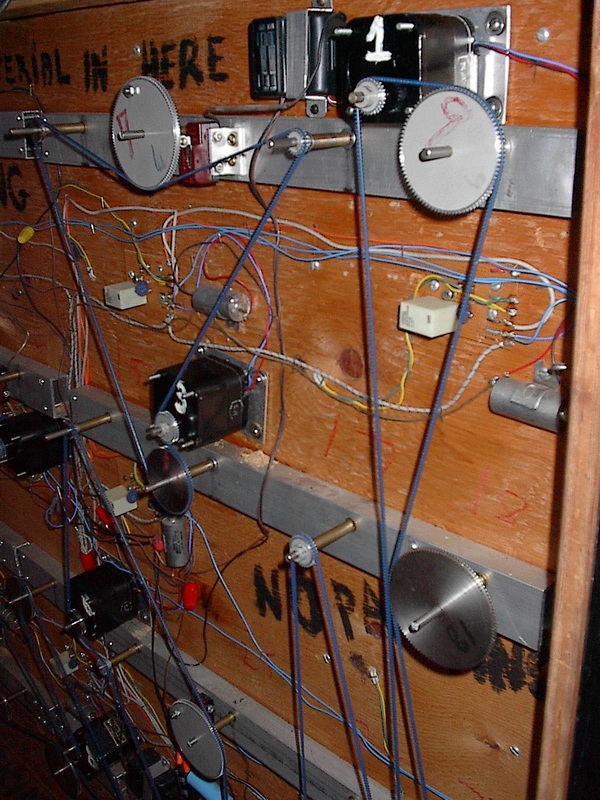 First exhibited in 1968 in the exhibition “The Machine at The End of Mechanical Age” at the Museum of Modern Art, New York. A second edition was exhibited in 1969 in the Brooklyn Museum of Art, New York. 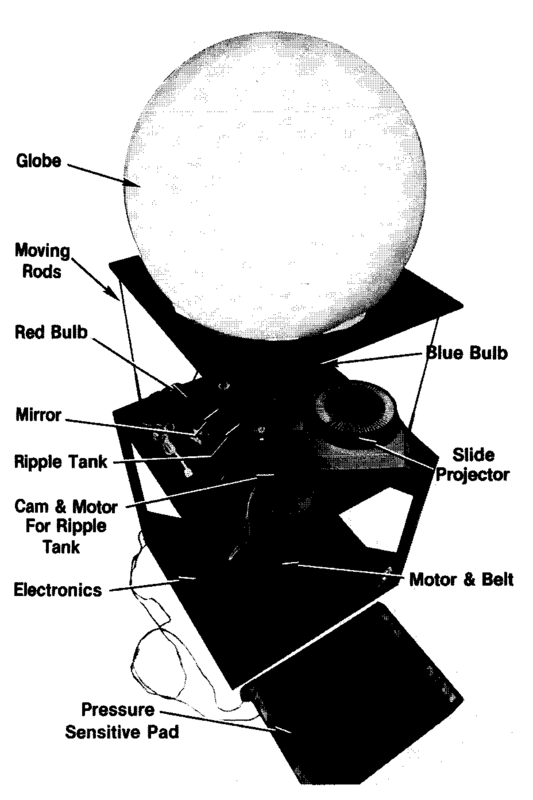 An interactive kinetic sculpture contained in a minimal structure with a dome. The observer may step on a pressure-sensitive pad, which triggers motors that generate a number of vigorously dramatic effects on the dome. 20’x 5′- Copyright © Lillian F. Schwartz 1985, 2012 All rights reserved. A computer-controlled mobile in Homage to Calder. Created by Schwartz WITH HELP BY ARNO Penzias. Although the kinetic sculpture creates an illusion of heaviness, it is relatively light. The massive-looking piping is a thin-walled tubing intended for bathroom fixtures suggested by Arno A. Penzias. A computer-controlled mobile in Homage to Calder. Created by Schwartz and Penzias. Parts are wrapped in Garage. Motor and chain are in basement. The sculpture, Capricious Constellation, combines mechanics, one of the oldest branches of science, with computational mathematics, one of the newest disciplines, to create an unending series of patterns. 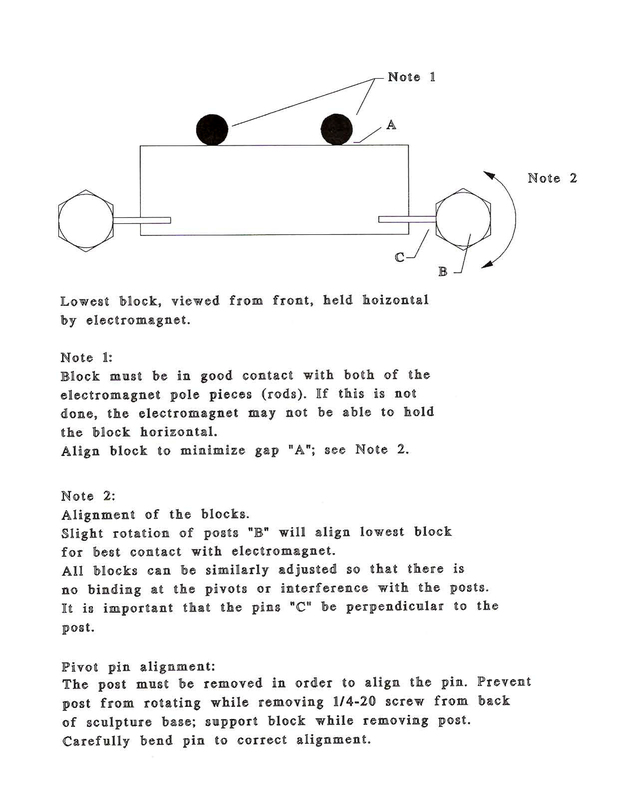 The back-and-forth rotations of the computer-driven central arm, and the power of inertia, combine to drive the quasi-epicyclic motions of the lower levels.Alexander Calder pioneered this art form with a series of wind-driven mobiles. Since an indoor museum-setting precludes the exploitation of wind as a driving force, some museums – notably The National Gallery in Washington, D.C. – have posthumously motorized some of Calder’s later works. “Capricious Constellation” pays homage to Calder’s original concept of the mobile as a source of never-ending variety by substituting a computer-based source of random energy for the missing wind power. Capricious Constellation’s structure makes intentional use of massive-looking piping studded with heavy hexagonal joints, (causing one critic to describe the piece as a “huge steel structure”), in order to heighten the viewer’s surprise at the lightness of its motion. In reality, thin-walled, chrome-plated, brass tubing creates the illusion of bulky steel while minimizing weight and providing great tensile strength. The changing constellations formed by the sculpture’s mechanical members are heightened by the light and shadows cast by sideways illumination. The result is a dynamic and unpredictable choreograph. Just as Calder applied his background in engineering to his work, the present work reflects the scientific as well as the aesthetic interests of its creators. Copyright © Lillian F. Schwartz 1985, 2012 All rights reserved. When someone enters the room, sound sensors deactivate the circuitry that generates a magnetic field, releasing the metal blocks upward. 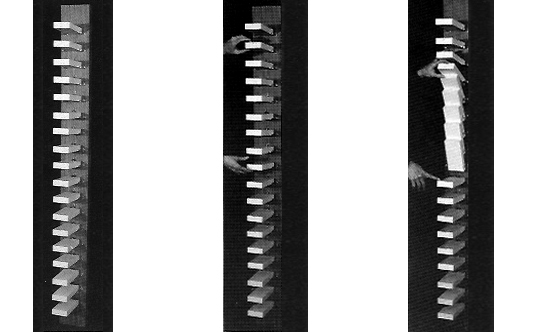 The artist’s hands are resetting the blocks. Rectangular wooden blocks are made of balsa wood with the appropriate weight of metal bars placed at the bottom to hold the blocks in a horizontal position until they are released. The bottom block has a magnet that is released when a pressure-sensitive pad on the floor is stepped on causing this block to fall “up”. The blocks are reset by hand. Assisted by Arno A. Penzias. H 87 1/2″x 34″ at widest part – Copyright © Lillian F. Schwartz 2012 All rights reserved. A number of stainless steel sculptures were created out of bands of stainless steel that were twisted and spot welded. Has triangle stainless steel rods that support twisted bands of stainless steel. Welding by Arno A. Penzias. 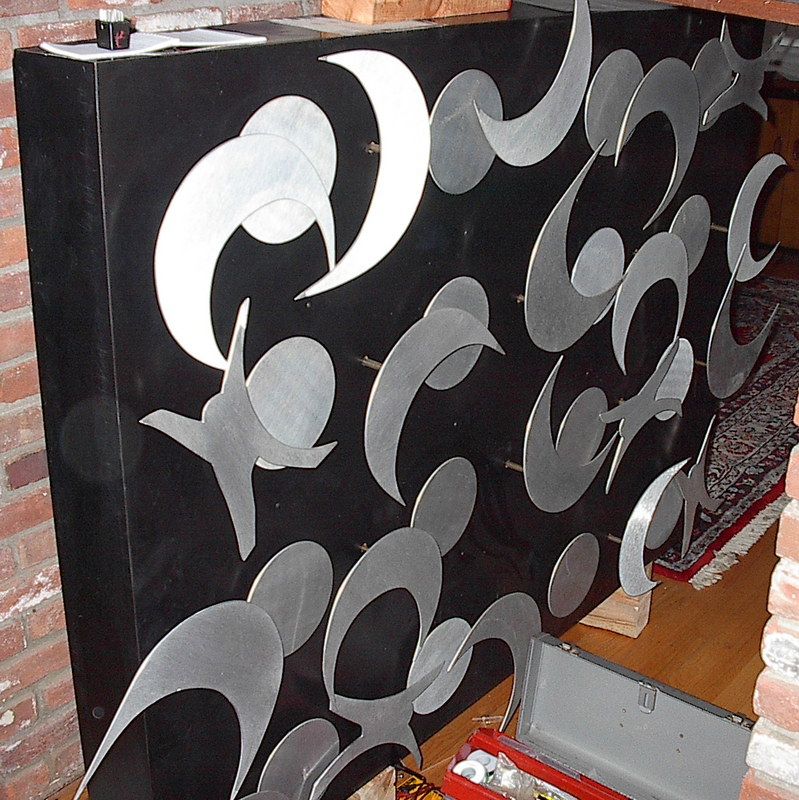 48″ high x 60″ wide x 6″ deep – Copyright © Lillian F. Schwartz 2012 All rights reserved.
. A kinetic sculpture, Homage to NASA is made up of 30 abstract aluminum shapes on the face of the sculpture. These shapes, suggesting man, sun and the moon are attached to shafts that have gears at the backside. Belts that are controlled by nine motors move the gears. There are electronics in the back that activate the motors. There are five flashes. Shining light on solenoids embedded in the sculpture’s frame creates motion. 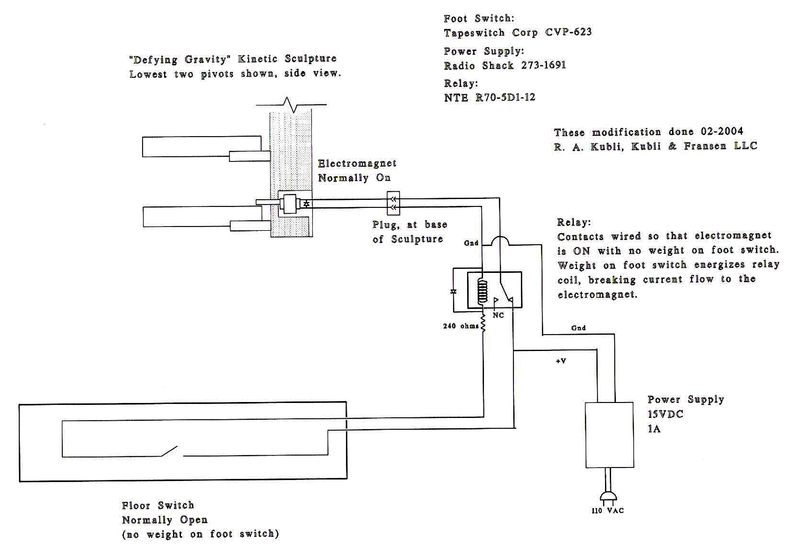 A plug can be inserted into the lower right side of the sculpture frame to allow the sculpture to run automatically. Copyright © Lillian F. Schwartz 1987, 2012 All rights reserved. 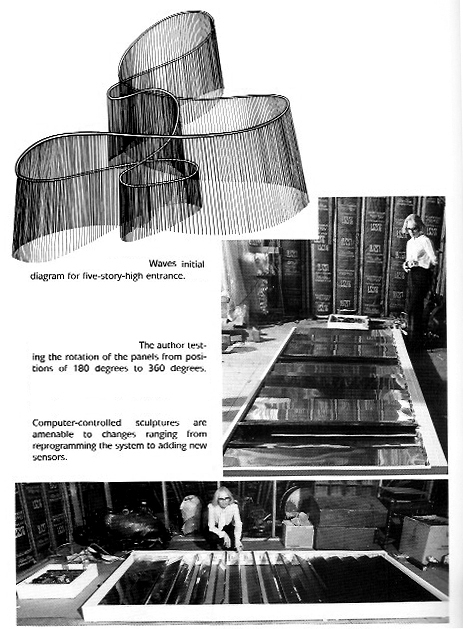 In 1987 Lillian Schwartz was commissioned by Bell laboratories to create a five story high computer-controlled kinetic sculpture in honor of Physicists Joseph Davison and Lester H. Germer who gave the world a new view of matter as light.